A piece from a package wrapper was recently listed on eBay (Sep 14, 2018). 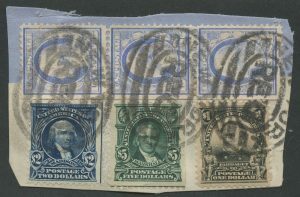 The small blue and white piece is franked with six stamps, a vertical strip of three 3rd Bureau Washington-Franklin 15¢ stamps, and three 2nd Bureau $1, $2, and $5 stamps for a total of $8.45 of postage. 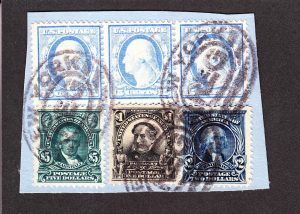 Five of the six stamps have one straight edge. All of the stamps are canceled with three New York registry killers. Unfortunately, there are no postmarks bearing dates. 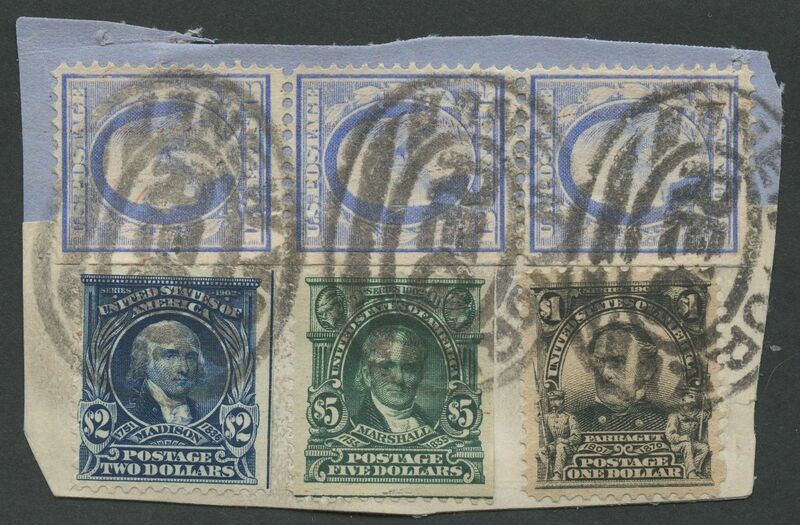 Depending on the watermarks on the 15¢ stamps, the date of mailing could be constrained a bit. A double line watermark was first used on the 3rd Bureau stamps in early 1909 (Scott 340). The single line watermark made its debut in 1911 (Scott 382). I’ve been maintaining a census for both the $2 and $5 2nd Bureau stamps for more than ten years. This piece adds to both censuses and is designated 312-14 (for the $2 Madison stamp) and 313-13 (for the $5 Marshall stamp), the 14th and 13th items in each count. This wrapper is very similar to another piece designated 312-5 and 313-9 in the censuses and is displayed below. 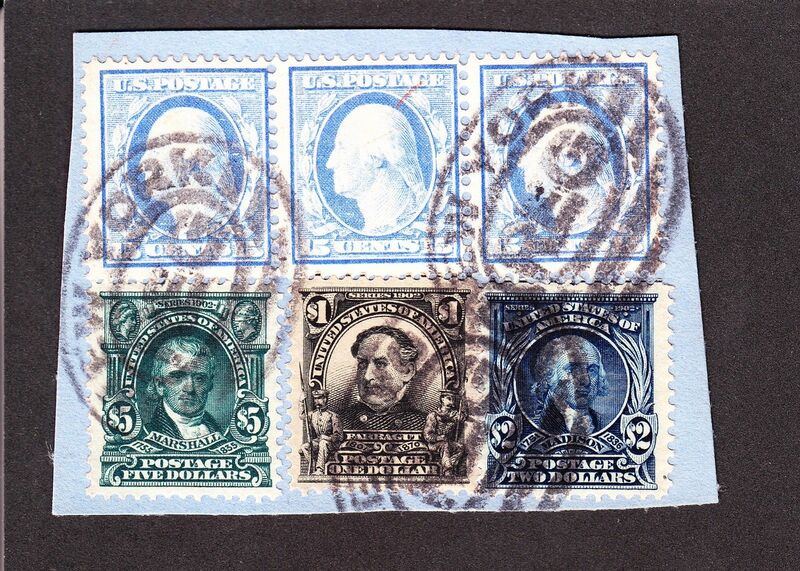 This item recently sold on eBay (April 28, 2018) for $1350, and has an accompanying Philatelic Foundation expert opinion that identifies the 3rd Bureau stamps as Scott 340, therefore circa 1909. I would surmise that both of these items were sent in 1909 or 1910 by a large company or financial institution. They had not yet used up their supply of high face valued 2nd Bureau stamps and were using the recently printed Washington-Franklins for more common lower denominations. The $8.45 franking may have paid the 10¢ registry fee plus 417 times the 2¢ first class mail rate for a 26-pound package. For this business or bank, this may have been a fairly typical package to send, perhaps other wrappers or pieces are in Washington-Franklin collections. Hi Geoff, in your census of the $2 and $5 stamps, there is an article bearing both the $2 and $5 to Switzerland (312-4, 313-6), and you mentioned that this article is philatelic. Is there any possibility of the article being commercial in nature? The article was sent using an envelope from the financial services giant Ladenberg Thalmann to the young Armin Meili (age 12 at the time of mailing), and it appeared in Mr Roger Brody’s exhibit on the usages of the 2nd Bureau issues, where it was described as “Envelope accompanied parcel”. If we use the UPU letter rate of 5 cents per half oz, then a possibility is a parcel weighing 4lb 5 oz that requires 138 x 5 cents plus 8 cents registry fee to give a total of $6.98 and so 2 cents overpaid? I think your scenario is indeed possible. I was leaning towards the item being philatelic due to the simple dollar franking with no other stamps.